Every member of AquaMarine’s Dive Team is a Renewed PADI Member: Divemaster or above, and in fact more than 70% are PADI Scuba Instructors (or above) with additional Specialty qualifications. 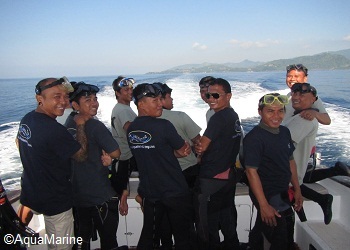 We are proud that all of our dive staff are Indonesian, not only Balinese but also from other areas of Indonesia. 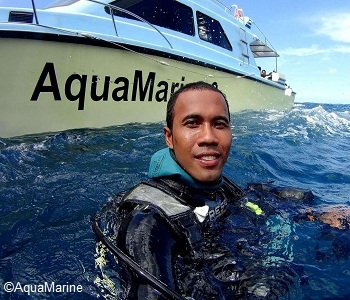 All were chosen for their skills, but also for what they as individuals bring to AquaMarine Diving – Bali, in terms of knowledge, experience and talent. All members of the AquaMarine Dive Team are very experienced and know the dive sites around Bali exceptionally well. AquaMarine only offers Bali’s better dive locations and, although the weather changes seasonally, our dive guides do not. Therefore, AquaMarine’s dive guides are able to share with our guests the knowledge they have acquired through years of experience seeing seasonal, climatic and manmade changes at the dive sites. Read the dive team profiles to learn a little bit about whom you may be diving with – or maybe someone you have already met! I am Director of Diving Operations. I have been with AMD-B since the beginning in September 1999. I was born in Amed in north east Bali so since childhood I love sea, until now. I love diving and teach as much as possible people starting love the ocean. Before start diving, I experience lot of jobs and try lot of things. I started work with AMD-B on 13 May 2002. 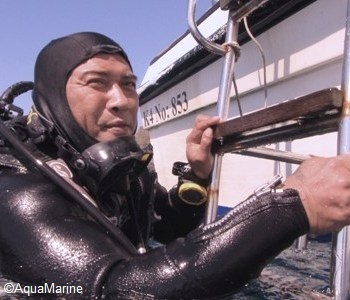 My most memorable experience as a diver was nearly losing my own life to save someone else. I like working in AMD-B because of teamwork and good management. Outside Bali I like diving in Lembeh Strait and in Bali I like muck sites around Tulamben. My favourite uw critters are juvenile and adult ghostpipefish because they are really beautiful. Interests Teaching, pelagics and macro diving. I really didn’t know about diving when I started, I just do it for a job, but when I became an Instructor then I start to care about our ocean environment, and really care about marine conservation. I hope everyone does the same, not polluting our oceans. I joined AquaMarine in April 2004. I am 38 years old and from Bali. I have been with AMD-B since 2006 and became an Instructor in 2009; I am a PADI Specialty Instructor in Drift, EFR and UW Nav. I prefer diving Nusa Penida, Manta Point and Crystal Bay because I like big stuff. In myhis free time I spend all my time with my wife and two children. Because of my experience diving around Bali, I think it’s the best place for diving, sun and having fun. Interests Nusa Penida and nudibranchs. I worked for 10 years from jukung (local outrigger) captain in Sanur to SSI Instructor. Then I join AquaMarine in 2013 and became PADI Instructor. I have 2 children, I love my family very much, when I am not diving, I am busy helping my wife and with my children. I have never dived outside Bali. After graduating high school, I joined a liveaboard as a crew member and learned to dive in Raja Ampat in 2006. After working there for 9 years, I returned to Bali and joined AquaMarine on 26 November 2014. I became a diver to know about underwater marine life, like fish, coral, and creatures, and very, very enjoy to see Mantas…! I started work as an Office Boy at a dive company then, 1998, I learned how to swim, float and diving. Now I am a PADI Instructor. When I am not able to diving anymore, my plan is to go back home to Flores (E Indonesia). I would like to have a shop. I try really hard to be funny but I do not think people think I am, even though I think I am. My best memory as a diver was on my Advanced course I saw a whale shark! I really like when I met very difficult student but at the end they successful did the course. My favourite uw critter is Pygmy bobtail squid because it is hard to find but once you find it, it looks amazing. Interests Get to know many different types of fish. I am AMD-B’s Equipment Manager. I joined 1 July 2002. I love my job. AquaMarine gave me all the training including Divemaster in 2009. At the end of 2011, AquaMarine introduced its latest initiative to re-invest into Bali’s dive community: The “AMD-B 11 Month PADI Divemaster Internship 2012 for Indonesian Citizens”. Each January a maximum of four Interns start this programme with us. Each intern has an AMD-B OWSI assigned to them as a mentor however the entire dive team is participating in all aspects of their training (OWD to DM).